The beauty of Mongolia is in it's stunning countryside, not it's largely dull and unfriendly towns. Most independent travelers (or 'backpackers') relying on public transport risk ending up spending most of their time waiting listlessly for rides in drab aimag towns and cities. Public transport is intermittent and goes between towns; it is very difficult to find transport to the national parks and protected areas which are of more interest to the tourist. It pays to organize a tour or driver. Most travelers take this option, and share the cost. It is best to arrange this in advance!. My site includes the details of some reputable tour operators. Ulan Bator is the best place to organize a tour and/or driver. (Exception: if traveling to Bayan Olgii in stunning Western Mongolia, you will want a Kazakh Guide!). If wanting to tour to somewhere one-way (i.e. seeing the sights along the way then fly or bus straight back), it is much better to start your tour from Ulan Bator and tour out from there rather than fly/bus somewhere and try to arrange a tour back. If out hiking or horse riding, organize a vehicle to drop you off and pick you up in advance. 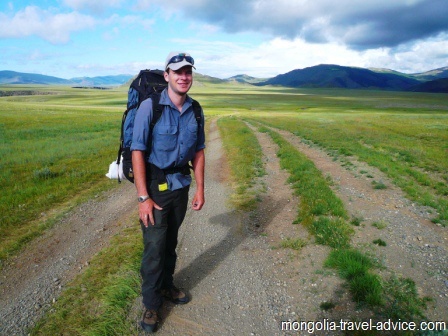 If you really don't want to take a tour, and you want to travel truly independently in Mongolia, you need to be self sufficient in camping and cooking gear (see my what to pack page) and in having your own means of transportation (car, motorbike, or bicycle). 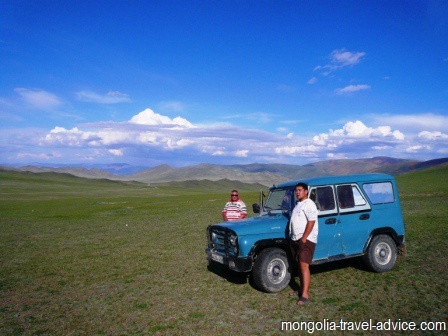 This is a fantastic way to see the country and travel independently in Mongolia. For the footloose independent traveler, accustomed to taking care of themselves, taking as long as they want backpacking through one destination before organizing a ride to the next one when it takes their fancy, the above facts can be a difficult to accept. The thought of renting a car and driver or, god forbid, taking a 'tour' is just anathema to their whole budget/ independent travel philosophy. I'm guilty in this regard: last time I went out to Western Mongolia, despite having already experienced the challenges of independent travel in Mongolia on other trips, my fiancee and I resolved to fly out to Olgii, get a private Kazakh driver and guide for Bayan Olgii, but then travel back to Ulan Bator under our own steam -taking in all the sights and highlights along the way back. We got back in the end, but I regret not organizing something in advance because we wasted most of our days in dull towns and aimag capitals waiting for uncomfortable public transport jeep rides, and missed a lot of sights along the way. I wish I had organized a tour out from Ulaanbaatar which finished in Olgii, rather than tour from Olgii to Ulaanbaatar. Why? Allow me to explain. In most developing countries, particularly in Asia but also Africa and Latin America, things just seem to 'work out' for the independent traveler. You can get off a bus in a strange town, and even if you don't have a guidebook or any idea what you're doing, people will come up and offer to take you to hotels or direct you the next bus or whatever. Taxi and cyclo drivers are lining up to take you wherever you want to go; it's just so darn easy! In contrast, when you arrive in any Mongolian town other than Ulan Bator, Olgii and perhaps Tsetserleg, nobody will approach you to help you or be able to communicate in English if you approach them, and it will be surprisingly difficult and time consuming to arrange your next ride out. Mongolia is one of the world's most sparsely populated countries, so there are fewer public transportation options, and the services that do exist are less regular than you might have experienced in other countries. Once arriving in a town there are a couple of options you'd probably consider. The first is to organize a jeep and driver to take you to the next town. The advantage of this is that you'll be able to leave when you want to, and see the sights and attractions on the way over. The Lonely Planet seems to say this is possible in every aimag capital, so it must be simple, right? In practice, arranging a jeep and driver is difficult outside Ulan Bator; there's nobody there to help you, no signs, no one speaks English. Even in Khovd, one of the larger cities in Mongolia, I could find a jeep and ended up having to call UB-based companies to scout around over the phone and arrange jeeps for me. If you do manage to organize a private jeep, which may take you a couple of days of listless wondering around and trying to find an english speaker in a nothing-to-see town, you will often have to pay for the driver's return time and fuel as he cannot be assured to find paying passengers on the way back (well, he probably will find some passengers, but you won't know about it!). This makes this taking different jeeps from place to place an expensive way to achieve independent travel because you're effectively paying twice for each leg -particularly if there are less than 4 of you. Also, the drivers in these towns are unlikely to have much experience with tourists or what they want. Touring, sightseeing, and customer service aren't familiar concepts; it will often become a race to the destination rather than a leisurely tour you may have imagined; one morning in Zavkhan province we had our driver wake us up at 4:30am -he didn't care if it was still dark, we wanted to get to Uliastai and that's what he was going to do as quickly as possible! Hiring private jeeps from town-to-town is not the optimal way to travel independently in Mongolia, you are better to organize one from Ulan Bator for your whole journey. The other option you'll consider for independent travel is to take public transport. This option is viable if you're simply wanting a bus straight back to Ulaanbaatar. It's not too difficult to locate the bus ticketing office (but it will invariably be poorly sign-posted and difficult to find), and buses in Mongolia are a comfortable way to get back to the city if you just want to head back directly and not view scenery or attractions along the way. However don't take a bus OUT from Ulan Bator to an aimag city and expect to be able to organize a tour from there; it simply won't happen. The other option is to take public transport in the form of a shared van or jeep to the next town or aimag city. I've already written about how extremely uncomfortable these shared vans and jeeps are (see my travel in Mongolia page). A tough independent traveler can handle this, the problem is that they will spend all day waiting for a van to fill up instead of being out enjoying the countryside. Shared jeeps will only go the most direct and easy route, which is probably the most boring one as far as the tourist is concerned, and -worse- will often not leave until dusk, ensuring that you won't see a thing along the way. You have to wait around all day in case the van suddenly fills up and departs, but usually it doesn't leave till the evening. You've already wasted a day, and now you head off bumping around in darkness and don't get a wink of sleep. You'll arrive at the next town at 5am, utterly exhausted and having seen nothing, realise there's nothing to see in the next town, either, and will have to start the whole painful process over again. You will save money, but you won't see much of Mongolia or it's spectacular countryside. Me, in Central Mongolia. Hiking or cycling is a great way for backpackers to travel independently. See my packing page to ensure you have all the gear required to be self-sufficient. Given the difficulties in independent travel outlined above, most people will opt to organize a tour. Don't think of horrible tour buses filled with waddling camera-toting tourists you'd find in Disneyland, think of 4 or 5 other like-minded travelers who are in the same situation you are! A tour doesn't have to be filled with inauthentic hand-holding and cheesy moments, usually all a budget 'tour' will consist of is hiring a driver and arranging beforehand where you want them to take you. Most people opt to add a guide to the mix (if the driver can't speak English) as they're cheap, it's easier to communicate your needs and wishes, and helps you learn more about Mongolia. Obviously, the cost of a guide and driver is cheaper when shared among four or five people than one or two. If hell bent on avoiding a tour or a guide and traveling privately, flexibly, and independently, you really should arrange your own means of transportation (car, motorbike, bicycle, or horse) in advance, and have your own sleeping and cooking gear. More and more tourists are opting to do this. You can rent cars, bicycles and motorbikes in Ulaanbaatar, or bring them in overland. For budget travelers, bicycles can of course be flown in from your home country, and taken on a bus to your favoured cycling starting point. This all involves a lot more time or cost than most people are prepared to make, so most people elect to arrange a tour. See my page on some good Mongolian-owned tour companies.